It was a perfect afternoon for Brandywine Baroque’s Venetian Carnival. A warm breeze was blowing the leaves from the trees outside the Barn at Flintwoods. The program was sold out, and the concert manager had to add more chairs to accommodate the extra guests. All told, over 100 people were fit into the intimate performance space to enjoy the concert. An all-Vivaldi concert is surely what people want to hear, these days. Often light and airy, this music is the antidote to our everyday worries. First up was the lovely Sinfonia Alla Rustica, RV151. In three movements, the piece quickly transported us to Venice, with its ornate, textured lyricism. It was a thrill to hear Grant Herreid on the guitar, with his beautiful tone penetrating the full-bodied music. For other pieces in the concert, Herreid performed on his theorbo, a large, lute-like instrument with 14 to 19 courses or strings. 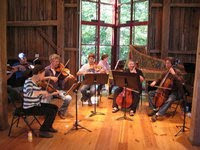 The unfretted bass-strings or “bourdons” make it the perfect figured bass instrument for a small Baroque ensemble. Cynthia Freivogel and Martin Davids performed together in the Concerto for two violins in A minor/RV 523 and the Concerto for two violins in D major, RV 511. Accompanied by the small chamber “orchestra”, these two violinists played flawlessly and perfectly in tandem. At times, their tones and phrasing were so similar and well-blended, it was hard to tell who was playing. They were paired with Douglas McNames and Donna Fournier (cellos), for the Concerto for two violins and two cellos in G major, RV 575. McNames and Fournier performed the Concerto for two cellos in G minor, RV 531. A winning piece, the two cellists played it with both warmth and gusto. It’s always a treat to hear soprano Laura Heimes. Her silvery voice floated through the motet Nulla in mundo pax sincera. The standard repeats were the perfect opportunity for her to showcase her agile trills and ornaments. Vivaldi exploited the rich, romantic timbre of the cello in his Concerto for Cello in B minor, RV 424. McNames handled the long, legato lines of the Largo with sensitivity and attention to phrasing. There were moments when it seemed Vivaldi had vaulted right out of the Baroque period and into the early romantic period: the structure of the phrases are lyrical and often brooding, and the thematic development is sophisticated.